Finally, I’ve come to review my favorite anime of all. I do have about five favorite anime, but I think this one above all is my absolute favorite. Kuroshitsuji, or Black Butler, is just…EPIC! There’s more than just anime for this one, too, so I’m reviewing it all in one! There’s the manga, the music, and the anime…and a musical, which I haven’t seen yet, and a videogame, which I have yet to play. 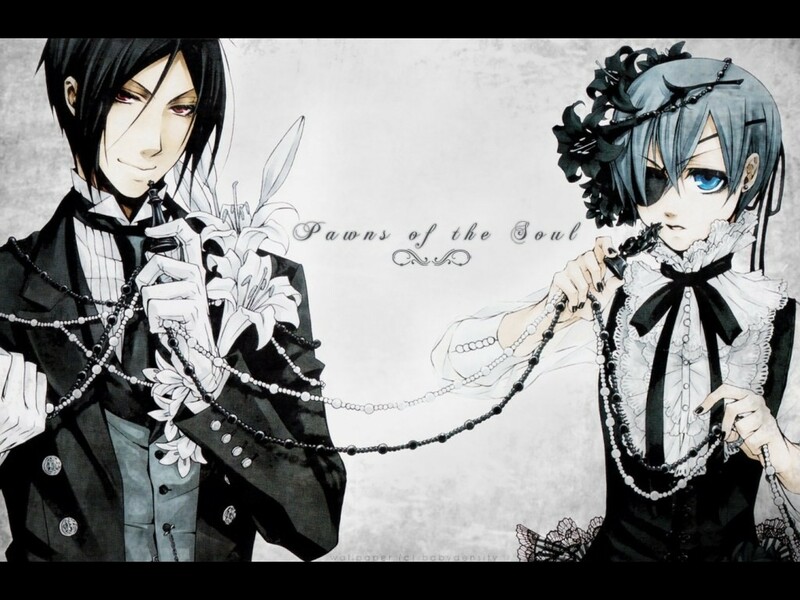 Black Butler is about a demon, Sebastian Michaelis, who makes a contract with a boy, Ciel Phantomhive. The contract is basically that Sebastian serves Ciel as his butler until he takes his revenge against whoever killed his parents; after that, Sebastian get’s Ciel’s soul. It’s set in Victorian England. The first season of Black Butler is about Sebastian helping Ciel take his revenge. The second season is just the continuation, but introduces a new demon, Claude Faustus. I don’t want to give anything away so that’s all I’m telling you. HA! On to my review. 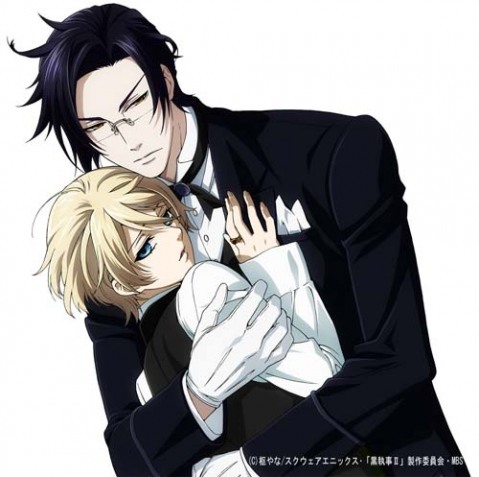 Sebastian really is “one hell of a butler.” He’s attractive, but so very mysterious. He’s funny when the time’s right; I’ll say one word…cat fetish. Ciel, even though he’s just a boy, is very mature. I love his character because you don’t expect him to be the way he is. Granted, once you find out everything he went through, you’ll be more sympathetic and understand. There are so many characters that I can’t describe them all, but I will tell you about a few of my favorites. 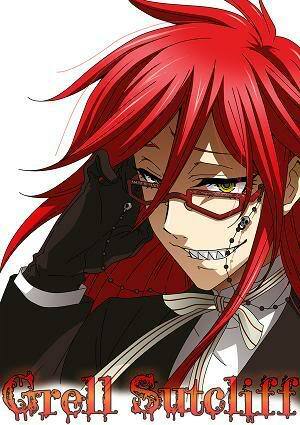 Grell Sutcliff is my favorite character second to Sebastian. This guy is hilarious and utterly drool-worthy. Grell is a Soul-Reaper and is absolutely in love with Sebastian, or Sebas-chan as he calls him, which I’m guessing would be like calling him Sebby for short. Undertaker is, well, the undertaker, and he’s very creepy, but in a fun way. Claude Faustus, who is only in the second season, is another demon. I know that a lot of people hate Claude and his contracted, Alois Trancy, but I actually like Claude. He’s an interesting character. I really wish I knew more about him than what the anime shows. I really do hate Alois though…he can just die! Some other important characters are Elizabeth, Ciel’s fiance, Madame Red, Ciel’s aunt, Queen Victoria, William T. Spears, another Soul-Reaper, Prince Soma, an Indian Prince, and Soma’s butler, Agni. There’s also the others who help in the Phantomhive manor: Finnian, May-Rin, Bardroy, and Tanaka. Oh, and I can’t forget Pluto, the hell-hound. The story can be very dramatic and at times there are some real loving moments. Sebastian is devoted to Ciel in every way. 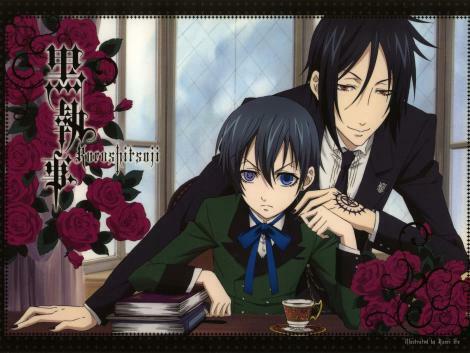 You come to realize just how important Sebastian is to Ciel and it can be very heart-wrenching. One episode in particular where you realize this is the episode involving the camera. This camera shows, in the photo of a person, the most important thing to that person that has passed on to the next world. The first season is out in English now, but the voices aren’t the best. Some of them are ok, but the Japanese version is better. Jun Fukuyama voices Grell, which is just perfect! 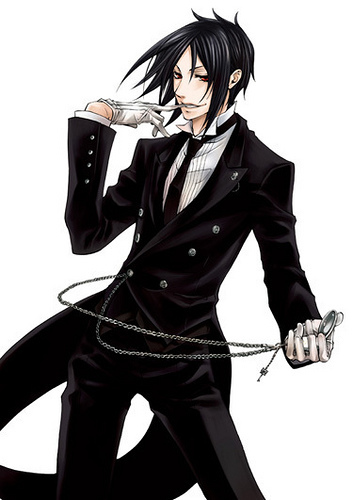 Daisuke Ono is Sebastian, which is another perfect match. In English, the voices are done with an accent, which I think was a mistake. Finnian’s voice is the worst, Jason Liebrecht, no offense, I just think it was a bad match. Undertaker is way better in Japanese, too; it’s so much more creepy. The anime is at a total of 36 episodes. The manga is so much more in-depth and is ongoing as of right now, 11 volumes. The anime stretches past the manga so the manga’s story hasn’t gotten to the point of even the first season of the anime yet. Usually I don’t review anything until it’s finished, but the manga is great, too. The artwork is beyond great and there’s so many more minor storylines. As for music, in the anime, it’s so good. The opening for the first season is Monochrome no Kiss by SID, the first ending is I’m Alive by Becca, and the second ending is Lacrimosa by Kalafina. The opening for the second season is Shiver by the Gazette and the ending is Bird by Matsushita Yuuya. You’ll want to get all the songs. However, there’s some you’ll want even more if you love this anime. You’ll want to get all the character songs, too, as well as the soundtrack. The character songs are all great! My favorites are the songs for Grell, Prince Soma and Angi (their duet), and Sebastian. All the songs are sung by the character’s Japanese voice actors. I love them!!! I can’t possibly describe all the good things about this anime, manga, and the music. I hope that the manga continues with the story in the anime and maybe past that so there can be a Kuroshitsuji 3! Watch it!!!! This is a video of the first ending credits. The song is one of my favorites and the video is…KAWAII!